Two-drawer lateral file offers side-to-side filing for letter-size, legal-size, or A4-size folders with the included hanging file rails. Interlock system prohibits the extension of more than one drawer at a time. Counterweight prevents tipping. 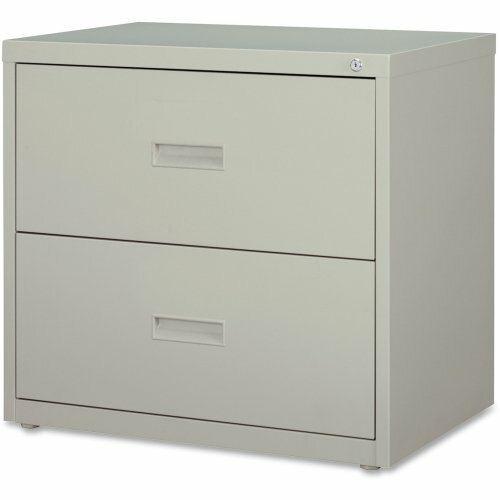 Both file drawers offer three-part, steel ball-bearing, slide suspension. Commercial-grade lateral file is equipped with a core removable lock, monochromatic drawer pulls and two adjustable leveling guides. Steel construction contains recycled material. Lateral file meets and/or exceeds applicable ANSI/BIFMA standards.